Sometimes, looks really do matter. There are about a million different PC gaming headsets on the market. I took a rough count and this number seems to be pretty accurate. Most of those headsets are, generally speaking, pretty solid pieces of hardware. Some fit better, some sound better. Most of them just look like headsets. But what if you want to look like you have a giant wasp on your head? Okay, maybe that's not the best way to sell piece of gaming hardware. 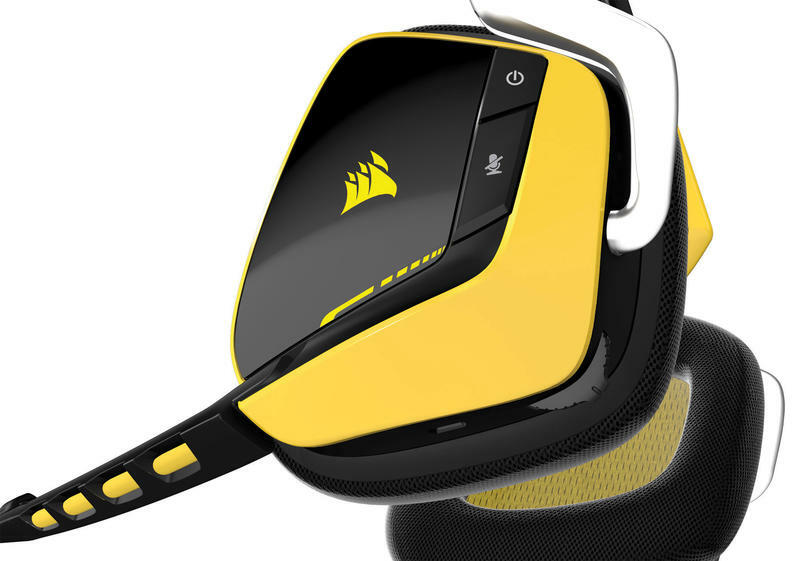 With their new VOID Yellowjacket RGB headset, though, Corsair hopes that looks will be enough to help them stand out in a sea of gaming headsets. A gaming headset has to sound good, deliver your voice clearly, and be comfortable enough to wear for a long session. 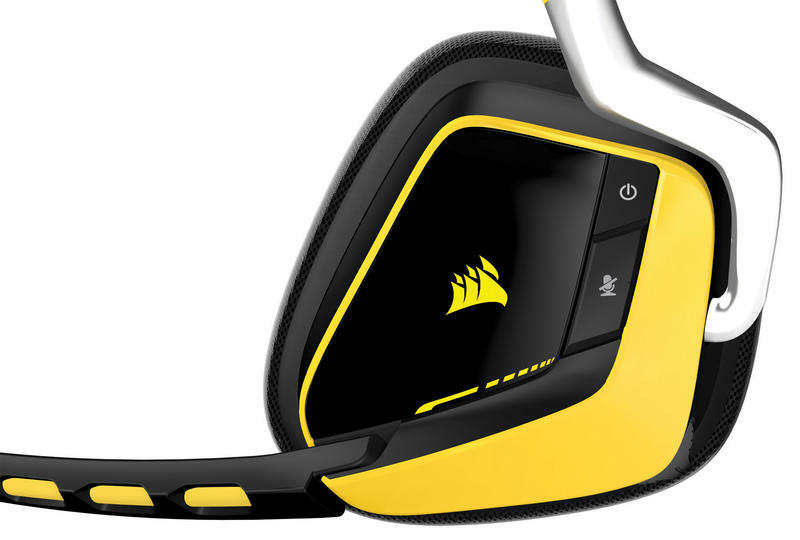 The Yellowjacket is, all around, a solid headset. Let's talk about the innards first and work our way out. The Yellowjacket sports a pair of 50mm drivers delivering 7.1 Dolby surround sound which can be customized through Corsair's ever more useful CUE software. The audio coming from the headset, regardless of game, was consistently clean and clear, and the detailed customization options in the CUE software ensure that if you take some time before you dive into your gaming session, you can get exactly the audio experience you want – setting up custom EQ settings that you can switch through using the push button volume rocker on the left ear of the headset. The default settings provide some pretty mid-range audio – it's not too bass heavy, and it didn't seem terribly tinny either. My old standby Astro A50 headset might edge it out in terms of overall quality, but they tend to be a little heavy on the bass, which can be distracting at times. That's definitely not the case with the Yellowjacket. On the other end of the audio I had a few more issues. Despite the headset featuring a nice wand mic, I had a tough time getting it as close to my mouth as I would've liked. Talking to friends on Skype and other audio services came back with complaints about the audio quality in comparison to other headsets I'd used. The mic is supposed to be flexible, but it really didn't move very much at all despite repeated attempts to force it into place. As this is a wireless headset, perhaps one of the most important features is the battery life. The VOID headset has some of the better battery life I've encountered, easily getting me through about eight hours of gaming with plenty to spare. Corsair advertises 16 hours of battery life and while I didn't time it out, that doesn't seem too far off. The CUE software did incorrectly report battery life a few times, freezing at a random percentage of battery life until I plugged and unplugged the headset, but it was easily resolved. While the battery life largely lived up to the promises inked on the back of the box, the range wasn't quite up to it. Now, it's worth mentioning that like any wireless device – router, phone, bluetooth, controller – the range of the signal isn't purely up to the device in question. The construction of the building and possible interfering signals can hamper the ability of the device to deliver its maximum range. With that said, while I was at my computer, the headset worked very well. Stepping away, though, was less successful. Putting any kind of wall between me and the base began to interfere with the quality of the signal, and the 20 feet to my kitchen caused a total drop every time. That's a lot less than the advertised 40, unfortunately, so if you're hoping to max that out, you may find that it needs a more or less straight line of sight to achieve it. There were two instances, though, where I was sitting at my computer – less than 5 feet from the wireless base – and lost signal. It only happened twice across roughly 30 hours of use, but that's one thing that's inexcusable. I said this thing looked like having a giant wasp on your head, and I mean that in the best way possible. Corsair took their specs and visited the team at BMW Designworks and came out with one of the better looking and more comfortable pieces of hardware I've ever used. The Yellowjacket edition combines yellow and black with a little bit of metal to create a gorgeous wasp-inspired piece of gear that, unlike quite a few headsets, doesn't feel silly to wear. It looks equally good sitting on the desk. The only shame there is that it doesn't come with a proper stand to display it. It's built out of sturdy feeling plastic for the most part, and uses memory foam for the ear cups, making it feel light, sturdy, and easy on the head. It's not going to stay on if you start an epic headbanging session anymore than any other headset, but it stays on comfortably while being light enough to wear for long gaming sessions. The other versions of the headset don't feature the same yellow highlights, but they still look pretty good. If you're gaming at a LAN session or in a massive tournament being streamed to millions, you can also setup the Corsair logos on the side to blink, flash, and pulsate in any of the millions of colors RGB LEDs are capable of. If you're gaming alone, turning these off might stretch battery life out a few minutes more. There are a couple other features on the headset worth mentioning, as well. The on-headset buttons are pretty sparse compared to a lot of recent headsets that use all four edges of each ear to perform one or more functions. Those headsets pack a lot of options, but can be cumbersome to become proficient with. The VOID on the other hand features a power and mute button, and then a button to control volume and switch EQ settings. It's easy to get used to and a bit refreshing after other overly difficult configurations. Then there's the InfoMic. The end of the microphone on the VOID has a couple LEDs that are meant to impart information about the headsets state and battery life. 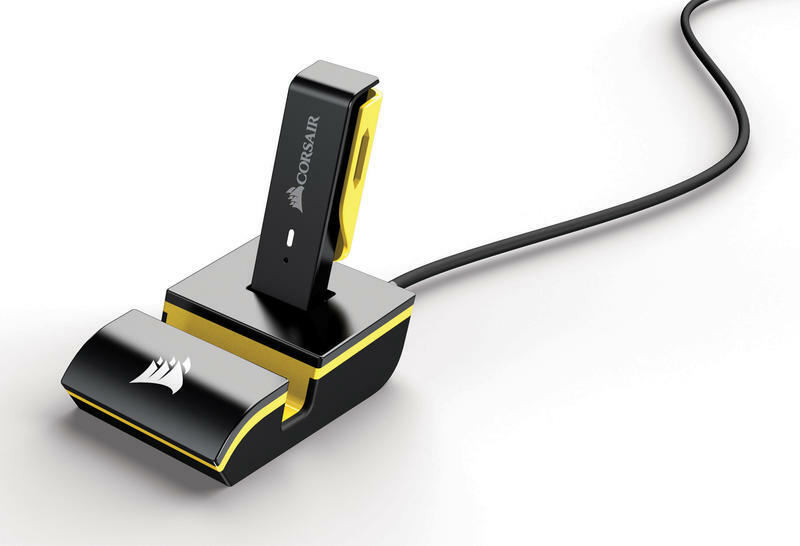 This is a neat idea that I didn't find nearly as useful as Corsair suggests it should be. 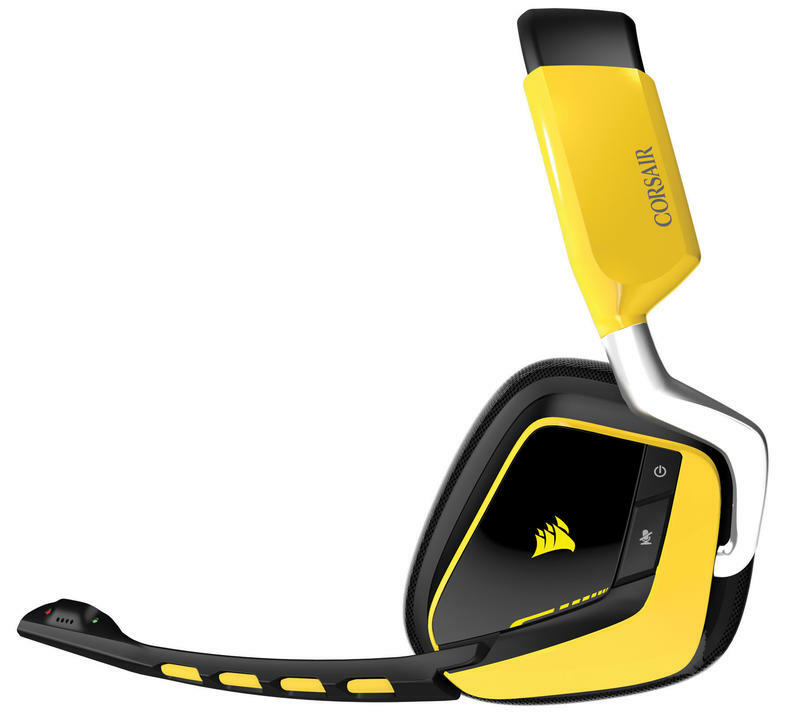 Corsair's VOID Wireless Dolby 7.1 Yellowjacket headset does all the basic things a good headset should do and has some of the best design. It looks like a piece of gaming hardware, but it's a pretty damn cool looking one. The $150 price tag puts it into the high end of gaming headsets, and it's a very solid step into that realm. 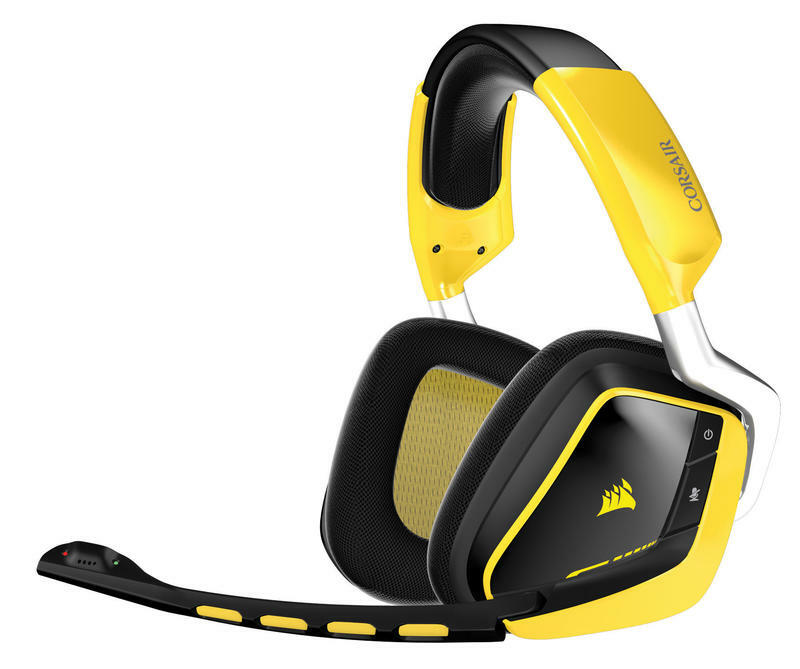 Disclaimer: We received the Corsair VOID Yellowjacket headset from the manufacturer. We spent over 30 hours with the headset in gaming and non-gaming applications before writing this review.